Our Christmas booking just cancelled, opening up the entire month of December since it was a 33 day booking. Please note that any bookings during the holiday period (Christmas to Jan 1) have a 14 night minimum as a courtesy to our cleaners, who appreciate not working on the holiday. Thank you for understanding. This outstanding condo, situated in the Kihei Hale Kamaole Resort, features ocean views from every room! Watch the whales from our lanai. The two bedroom plus loft, split level unit has over 1300 square feet of living area. Completely furnished in a casual, comfortable island décor, this townhome features ceiling fans in every room and air conditioning in the bedrooms for your comfort and enjoyment. The condo has been completely remodeled, with bamboo cabinets, granite in the kitchen and baths, tile floors. and an insulated wood ceiling to help keep the unit cool. The downstairs bath includes a designer tiled shower. The upstairs bath has a glass block wall separating the dressing area from the designer tile walk-in shower, providing lots of natural light. The condo was just painted, and features all new window coverings and carpet. The kitchen is fully-equipped for every cooking need. We've added amenities that most vacation rentals don't provide, such as wireless high speed broadband cable internet access, a printer (for your laptop or smart phone), beach chairs, picnic supplies, full size washer/dryer, etc. There are two pillow top twin beds in downstairs bedroom (which can be converted to a king), a queen pillow top bed in upstairs bedroom and a new queen sofabed in the loft with a "real" mattress. The development has a tennis court, swimming pools, large barbecues, commercial laundry facilities, as well as spacious landscaped grounds. 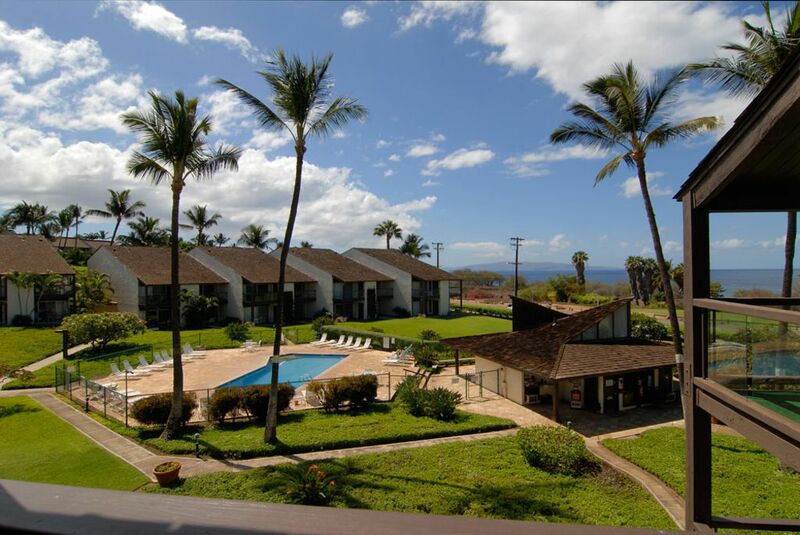 Our unit has great views from every room, including of the ocean, Molokini, Haleakala, and West Maui. It is located directly across from Kamaole III State Beach Park, which is known as one of the most beautiful and safest beaches in the Islands. It is perfect for swimming, snorkeling, sunning, jogging, picnicking, kite flying, and especially whale watching. Kihei is located about 20 minutes away from the Kahului Airport, on the sunny southwest corner of Maui. Hale Kamaole is one and a half miles north of Wailea, a beautiful planned development which features magnificent 18 hole golf courses, shops, boutiques, restaurants, Polynesian entertainment, and the amenities of several luxury resort hotels, including the Andaz, Mariott, Grand Wailea, Kea Lani, and Four Seasons. The Aquarium is also nearby. Lahaina and Kaanapali attractions are also within an easy drive. A 25% deposit is required to reserve the unit, with the balance due 90 days prior to your arrival date. To reserve, please send email with your requested arrival and departure dates, name and address. Full refunds are made for cancellations up to 90 days prior to your arrival date - after that, refunds only if we are able to rebook the unit for that period. Mark and Brenda - We reside in San Diego, California, and have spent several months a year here in Maui in this condo since we retired 10 years ago. We, as well as our friends and extended family, have enjoyed this condo for 35 years. We have made every upgrade available, several times over. We are proud of our condo and look forward to sharing our island home with you. We love Maui. The complex is ideally located - an easy walk across the street to a great beach with restrooms and park, and also to restaurants and shopping. We knew this was the one when we saw the ocean view from the condo. The condo set-up and complex are very family friendly. We love the location - right across from the beach. The pool is great for family fun and swimming laps. Kamaole 3 Beach across the street is one of the nicest beaches on Maui, with good swimming and snorkeling, and big lawn area and playground. It also has a protected cove area great for small children and easy snorkeling. Everyone seems to enjoy sharing stories and recipes at the community barbecues. Recently remodeled bathrooms with custom walk in tile showers in both, and glass block in master bath. Bedsheets, blankets, pillowcases, and pillows provided for all beds and sofabed. Quiet operation - you can't hear it! Plenty of dinnerware for your family! Dining table seats 4, with adjoining bar with 3 bar stools. Plus table and 4 chairs on the lanai. Great view of pool and ocean from lanai. Table and 4 chairs for outside dining.